Volunteer as an individual or bring a group of friends or co-workers. 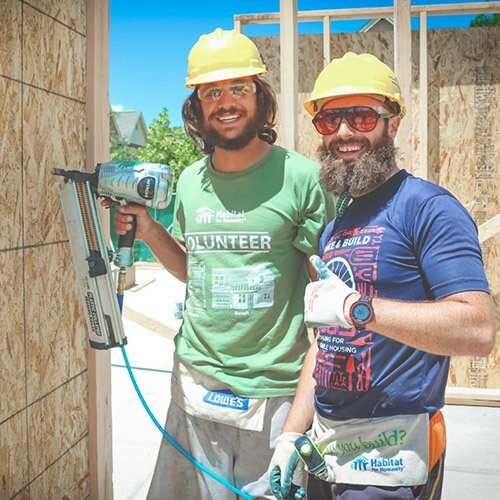 Volunteering with Habitat is a great team building opportunity. Contact our Volunteer Coordinator, Amy French, for available group dates, AmyF@HabitatRoaringFork.org or (970) 948-7207. Sign up here! First time volunteer? Don’t sweat it! We provide all tools and safety equipment. Just bring a smile. Our Construction Manager will walk you through safety training when you arrive. Completion of a waiver is required to participate. The waiver is found through online sign-up, here. Wear closed-toed shoes and clothes you don’t mind getting dirty. Please bring lunch and a water bottle. Sometimes our photographer comes out for photos, so you may even get featured on our Facebook page. A Habitat worksite is an inclusive, judgement-free environment. Our construction team is trained to teach you the necessary skills. No construction experience required. A full volunteer day normally starts at 9am, and ends around 3pm, but we’re flexible! That’s it — we’re excited to see you soon! Contact our Volunteer Coordinator- Amy French, AmyF@HabitatRoaringFork.org or (970) 948-7207.